This game was forged in a fire fueled by philosophy books, illicit substances, the tears of frustrated players, and leftover Magic cards. "Nobody remembers anything. Not when the world changed... nor why." Phantom Dust is a highly original action-RPG brought into the world by Microsoft Game Studios for the Xbox, directed by Panzer Dragoon series creator Yukio Futatsugi. The core gameplay consists of building "arsenals," each composed of thirty different skills of your choice. There are 320 such skills to choose from, plus the mandatory aura capsules you need to insert in your arsenal to use these skills. Like Magic: The Gathering, most skills require a specific amount of aura to use. Once the skill is used, your aura level goes down and starts to recharge. This is to prevent mad spamming of powerful skills. With the exception of the beginning of the game, you are randomly given four of these skills to each of your four main buttons (A, B, X, Y), plus three more random ones positioned near your spawn point that you can switch out with skills that you can't use at the moment or have been used up. Once you use one of the three, another random one will appear in its place until you've had access to all thirty of your skills/aura capsules. The basics of combat are relatively simple, but it takes dozens of hours of gameplay practice to discover how each skill can be used and how each skill can best benefit your arsenal as a whole. At it's simplest, the fights consist of the you (and usually a teammate) locking on and fighting against one to two opponents in various arenas; all with their own arsenals. The skills themselves cover a wide range of abilities, from buffs, to various projectiles, to energy blades, to super-powered melee attacks, to erasing other players skills, to abilities that affect everyone's gameplay. Additionally, each skill has an optimal range to be used at. Like the combat engine, the story of Phantom Dust seems simple but hides a lot of depth. The game starts off by explaining that everyone in the world, save one person, has lost their memories thanks to the eponymous substance. The phantom dust, poisonous particles that have the potential to erase peoples' memories and very identities, now covers the earth, forcing people to flee to underground cities to escape the dust and the monsters that came with it. Thankfully, the dust isn't all bad. Certain people, when exposed to it, can transform their will into energy. These people, called Espers, search the surface world for clues to what happened to humanity and to find a way for humans to resettle the surface so the human race won't go extinct from something as pathetic as rickets. In the opening cutscene, several Espers fight their way to two cryogenic capsules on ledges hanging over a gigantic crater. Inside these capsules the protagonist and an apparent acquaintance of his, named Edgar, sleep. Once they are brought down to this group of Espers' underground base, it is discovered that they are exceptionally gifted at controlling the dust (who saw that coming?!) and they are initiated in to the Espers' organization. The rest of the story is told via missions various characters give the protagonist and through certain memory boxes containing background information, which are obtained by beating missions. 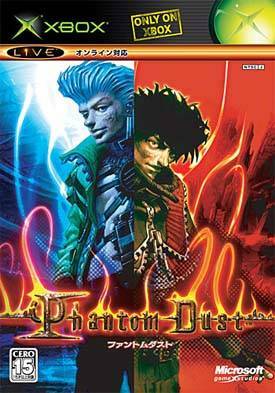 Although it was a budget game, the unique gameplay of Phantom Dust earned it a cult following thanks to multiplayer via Xbox Live, which sadly ended coverage for all original Xbox games in April, 2010. At E3 2014, it was suddenly announced that the game would be given a multiplayer-only reboot for the Xbox One by Darkside Game Studios, but was cancelled in 2015 due to budget constraints, which also resulted in Darkside closing down. Microsoft still planned to release the game, but after years of Development Hell, it was revealed at E3 2016 that a port of the game was in the works, and was released in May 2017 for Xbox One and Windows 10 as a free-to-play title, with XBox Play Anywhere support. After the End: The whole world is dead baring horrifying abominations that defy most of the normal rules of what defines life. The world is so screwed up in places that the laws of physics and gravity are starting to break down. And this is before You find out this is a recreation of the world. Humanity went extinct thousands of years ago leaving only a greyis white dust covering the planet which Edgar found after returning from his time in space, the dust gives humans godlike powers to create anything they want but slowly poisons them to death. Everyone alive is made of it and the person who created them all is dead. Alleged Lookalikes: The enemy referred to as "redhead" is mistaken for Freia, despite the former's monstrous appearance and the troublesome little detail that Freia's hair is platinum-colored. Anti-Frustration Features: The Updated Re-release introduces a few of these. Failing three times in a mission allows players to skip it. Arsenal building is introduced earlier in the single player campaign. All skills in multiplayer are available to purchase from the beginning, when originally their availability was tied to the progress made in the main campaign. Skills can also be obtained by starting up the game and logging in daily, with a special skill if the player logs in four times within a weekly time frame. Said skills can also be purchased as paid DLC. Big Eater: Implied with Chunky, who spends much of the game trying to secure additional rations or complaining about the scarcity of rations. In spite of this and his namesake, he's not even fat. "Blind Idiot" Translation: Lots of dangling participles, confused syntax, and non-sequiturs. Blood Magic: Many faith based skills require you to sacrifice health in addition to the standard aura cost. A basic but effective faith strategy is to use health absorbing skills to compensate. Cast from Hit Points: Several Faith spells require you to sacrifice health in order to cast powerful spells. Chronic Backstabbing Disorder: Sammah goes on a covert scout killing spree that ends with him ambushing and being defeated by the player character. He openly plots revenge and takes every opportunity to attack or sabotage the player. Deflector Shields: Optical Defense techniques. Downloadable Content: The remaster features both paid and free DLC that grant players with additional skills. Energy Absorption: More like "projectile absorption." Depending on the skill, it can either turn the absorbed energy into health or aura. Fire Balls: Bullet of fire is the first skill the player ever uses. Flaming Sword: Swords of fire, lightning, and ice are in the nature skill set. You can see one in action in the opening video. Hell-Fire: A few faith skills, like demon's flame and fire of gehenna. Both cost health to cast and deal more damage than standard fire skills. Hospital Hottie: Mikkan runs what is often referred to as the clinic of the Visions. Based on the extremely filthy and downright dangerous accommodations and the fact that she neither does nor can know anything about medicine, one can assume she got the job just because she looked good in the Naughty Nurse Outfit. Ki Attacks: The ki school, which consists of the most close-ranged skills out of any other school and allows for superhuman martial arts and energy attacks. Laser Blade: The long-range focused optical school has laser blades as one of their only means of close-range offense. Psycho has psycho blades, swords evidently made from psychokinetic energy, and the faith school has abilities like muramasa, blades made from God knows what. Meaningful Rename: Spokesman suggests a number of meaningful names for you to adopt at the beginning of the game, as almost everyone has lost their real names and taken on new ones that they like the sound of. If you refuse all of them, he snaps and dubs you Nanashi, which means literally "nameless" or "no-name." Mercy Invincibility: For both you and enemies after getting knocked down. Once you get up you'll spend a couple seconds flashing a bright color before you are vulnerable once again. However, there is one exception; the Pursuit skill can hurt an enemy that is face down on the floor. Money for Nothing: An in-universe example. Credits weren't used for anything before the invention of the arsenal, meaning Espers are paid in a useless currency. Chunky states it was just satisfying to watch money pile up. More Dakka: Octolaser, predictably, shoots eight lasers. It's the most projectiles any single skill can put on the screen at once. Playing with Fire: The nature skill set contains a few fire-based techniques. Red Oni, Blue Oni: Your character is the Blue to Edgar's Red. Shock and Awe: Lightning skills are within the nature set. They're usually single-use abilities that inexplicably erase enemy skills. Static Stun Gun: paralyze and paralyze barrier may count, though they're optic skills instead of part of the standard nature skill set. When afflicted, enemies jerk about in place while being zapped by electrical currents. Survivor Guilt: Tsubutaki's intense guilt over an unforgivable sin she can't remember ends up being a case of this. These Are Things Man Was Not Meant to Know: Halfway through the game the Visions learn that they and all remaining life on Earth is nothing more than copies created by the titular dusts and the final living human's memory of past civilizations. This discovery quite literally causes the Vision leaders who witnessed the memory box to cease to exist. The player was spared because his form had MUCH more detail put into it making him more resistant to the truth. With Great Power Comes Great Insanity: Cuff Button notes that powerful espers are often unstable in one form or another. Almost every NPC esper is deeply dysfunctional. So uh, a spaceship crashed in my yard.